These Crockpot Cheesy Potatoes are an easy side dish, made completely from scratch with fresh potatoes! Perfect for a holiday dinner or potluck! With step by step video. I mean, there is just nothing that is more healing than a big plate of crockpot cheesy potatoes that you hardly spent any time preparing, am I right? The weather is slowly getting warmer, but we’re not in the clear just yet here in Manitoba, and I’m still digging all the comfort food. This is basically all of my favorite foods in one dish: creamy potatoes, creamy cream sauce, and melty cheese. Serve it up with your Easter spiral ham or Christmas crockpot turkey or your weeknight meat loaf and you’ve got one winner of a dinner! Somehow, we were blessed with one daughter who has despised potatoes for years. But ever so slowly I am making her come around, and these super easy, crockpot cheesy potatoes are something she will never turn down! First, I cook up some onions and spices. This step is optional. The browned onions add a bunch of flavor, but you can skip it if you want! Second, we chop up those potatoes. You can peel them if you want, but I refuse. 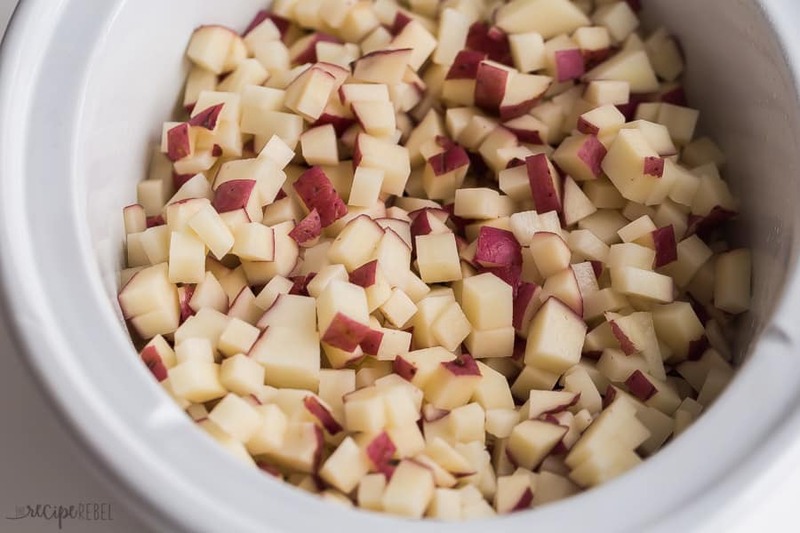 I use red potatoes and the skin is thin and smooth, and once they’re chopped up into a dice, no one really notices (plus, all of the nutritional value in there!) See the picture below for roughly the size you’re looking for. 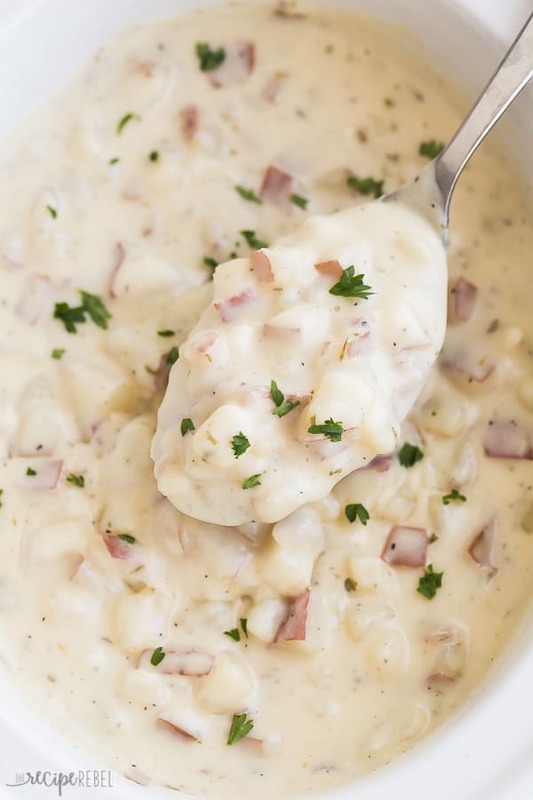 Throw your potatoes in the crockpot with some cream, broth, and corn starch. Choose cream instead of milk because the higher the fat content, the easier it can handle the heat (and less likely to curdle). Cover and let simmer away until they are tender and the sauce has thickened — stir once during the cook time if you can to make sure everything is cooking evenly. Stir in the cheese and serve! 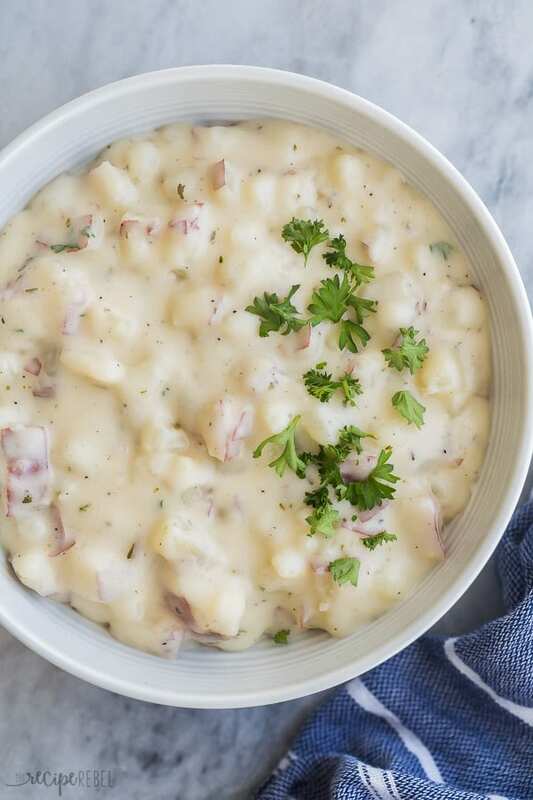 No frozen hashbrowns, no cream soups — just homemade creamy, cheesy crockpot potatoes with minimal effort! If you want to skip the real onions (and the browning), simply add 1/4 teaspoon garlic powder, 1/4 teaspoon onion powder and the other seasonings to the sauce mixture when you whisk it together and continue on with the recipe. If you’re really in a pinch, you can substitute an equal amount of frozen cubed potatoes and you just don’t have to tell me you did. (p.s. it will still be delicious). You can add other vegetables into the pot with these slow cooker cheesy potatoes, as long as they will cook in about the same amount of time. Frozen peas or carrots, green beans or mushrooms would work great. If you’re adding broccoli, add it at the end of the cook time so that it steams briefly and doesn’t become overcooked. You can chop up some ham or smoked sausage (or cooked chicken, etc, etc, etc.) and stir it in with the potatoes to cook. These cheesy crockpot potatoes become a full meal deal with no extra prep time! I like to use my 2.5 quart casserole crockpot for this cheesy potatoes recipe — I love how it cooks quickly and fits perfectly! It’s my favorite slow cooker, especially for things like side dishes and desserts. I also have a 4 quart crockpot and a 6 quart Hamilton Beach slow cooker — I know that they all cook differently. My crockpots tend to cook more quickly, and my other slow cooker is on the cooler side so things take longer. It’s important to know your crockpot and if it tends to be hot or cool. A full crockpot will cook more slowly as it takes time for the heat to penetrate. On the flip side, if you’re using a jumbo slow cooker and there is only a thin layer of potatoes, it will cook quickly and you may want to knock some time off the cook time. These Crockpot Cheesy Potatoes are an easy side dish, made completely from scratch with fresh potatoes! Perfect for a holiday dinner or potluck! In a medium skillet, heat oil and onion over medium-high heat, stirring often, until lightly browned. Add salt, garlic, thyme, parsley and pepper. Cook and stir 1 minute. 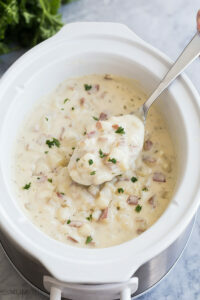 Place potatoes in a 2.5-4 quart slow cooker and add onions. Whisk together cream, broth and corn starch and pour over potatoes. Stir. Cook on high for 2-3 hours or low for 4-5 hours, until potatoes are tender, stirring at least once to prevent burning (I stir every hour if on high). Stir in shredded cheese, season with salt and pepper to taste, and serve. *See notes in post above about substitutions for fresh onion if you need to save a little time. LOVE how creamy and cheesy these are! YUM! Soooo good, these creamy cheesy potatoes are to die for! These look delicious. So easy in the crock pot! Yes! The slow cooker makes them so easy! Best slow cooker potatoes ever! Everyone loved them! Potatoes and cheese together are always a win! I can’t wait to make these! Yum!